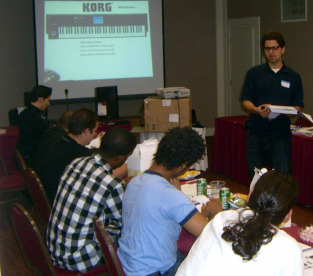 Training Snacks is a consultancy with more than twenty years of professional experience in both employee training and content creation specific to the pro audio industry. We also specialize in social media management and product promotion. Whichever the medium, we pride ourselves in aligning our goals with those of our clients and in providing high-quality content and attentive service to manufacturers, employees, and consumers. Training Snacks has worked in boardrooms and in brick-and-mortar retail environments. And while we are deeply versed in music technology, we are not limited in our ability to provide training and other services to any business, large or small. Do your employees or management team need video training? Copy for ads or promotional/marketing materials? Advice on how to establish and grow your brand using social media? If so, Training Snacks is here to help.